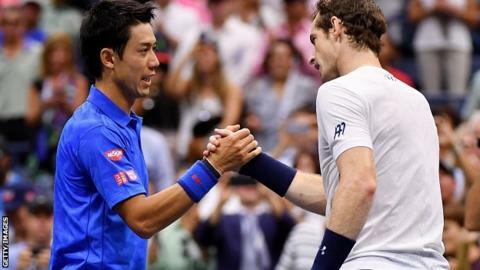 Britain's Andy Murray made his earliest Grand Slam exit of the year as Japan's Kei Nishikori fought back to win their US Open quarter-final in five sets. Murray, seeded second, led by two sets to one but eventually lost 1-6 6-4 4-6 6-1 7-5 in three hours 57 minutes. The Wimbledon champion lost his rhythm after rain brought the roof across, then his cool when the stadium sound system interrupted a break point. "It was too exciting on the court, but I tried to stay calm," said Nishikori. Sixth seed Nishikori, the 2014 runner-up in New York, goes on to face Stan Wawrinka who beat Juan Martin del Potro 7-6 4-6 6-3 6-2. Nishikori added: "I didn't start well - he has a great return - but I finished well. "The rain delay helped me to change tactics. I tried to hit a few more drop-shots than usual today and it worked really well." Murray, 29, had been on course to become only the fourth man since the Open era began in 1968 to reach all four major finals in the same year. He was Australian and French Open runner-up before winning Wimbledon. Murray began in terrific form, overpowering Nishikori in a 35-minute first set, but he lost control of the match when a passing rain shower led to the new roof being brought over Arthur Ashe Stadium. Nishikori levelled at one set all and infuriated Murray by breaking straight back three times after losing his serve. Murray's frustration only grew when he let a 40-0 lead slip at 4-4 in the third, but he looked to have finally taken control when the Scot took the next two games. His momentum stalled dramatically early in the fourth set when he was seemingly in charge of a rally on break point, only for the stadium sound system to emit a loud noise that caused the umpire to halt the point. Murray was furious, arguing with both umpire and tournament referee, but the point, the game and, within half an hour, the set went Nishikori's way. "They stopped the point and I was just curious why that was and that was it," Murray said. "Did it affect me? Definitely." A butterfly persistently fluttering around the net only added to Murray's annoyance as the 2012 champion lost seven straight games, but twice fought back from a break down in the fifth set to edge ahead at 5-4. With 16 service breaks between them, there seemed every chance Murray would finally get over the finish line, but Nishikori played superbly to hold to love and it was the Japanese who then claimed the 17th and decisive break. There was to be no final set tie-break as Nishikori proved the stronger with another nerveless hold that ended Murray's hopes. "Early in the fourth set, with Murray leading by two sets to one and a break point up - and in control of the rally - a let was called as a sound like a gong was heard under the closed roof. Murray allowed himself to be distracted for too long as Nishikori ran away with the set to take the match the distance. "A hugely successful summer started to take its toll on Murray here in New York. But having already won Wimbledon and Olympic gold, this may be a disappointment that is not that hard to swallow." Fourth seeds Jamie Murray and Bruno Soares beat Australia's Chris Guccione and Brazilian Andre Sa 7-6 (11-9) 2-6 6-3 to reach the doubles semi-finals. Murray and Brazil's Soares will face French top seeds Pierre-Hugues Herbert and Nicolas Mahut in the last four. Herbert and Mahut saw off Robert Lindstedt of Sweden and Pakistan's Aisam-ul-Haq Qureshi 6-3 7-6 (7-4). Murray and Soares won their first major title at the Australian Open in January.